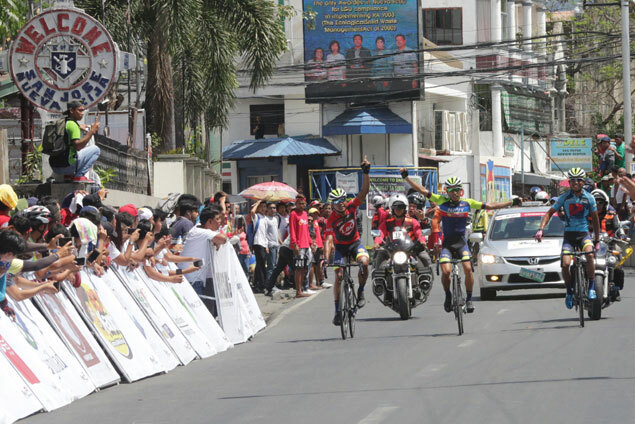 EL Joshua Carino reaped the fruits of his hard labor as he was gifted by Navy-Standard Insurance teammates Ronald Oranza and Jan Paul Morales the Stage Five victory in the Ronda Pilipinas that started in Echague in Isabela and ended in front of the San Jose City Hall in Nueva Ecija on Thursday. Carino, 24, towed the first group that broke away early and was the same person who led the action in the final six kilometers that allowed Oranza and Morales to go into the final two-kilometer stretch on top. The two top riders waited for the former to catch up and take Stage honors, all three clocking four hours, six minutes and 58 seconds. The Navy podium finish kept Oranza comfortably perched on top with an aggregate time of 17:40:13 and Morales, the defending back-to-back champion, a little less than five minutes off the pace at second with a total clocking of 17:45:12. Jay Lampawog of Go for Gold Development is at No. 3 in 17:48:56, Cris Joven of Army-Bicycology at No. 4 in 17:51:16 and Ronald Lomotos of Navy-Standard’s Ronald Lomotos at No. 5 in 17:51:35. Rounding out the top 10 were CCN Superteam’s Irish Valenzuela (17:52:34), Go for Gold Developmental’s Ronnel Hualda (17:52:34), Navy-Standard’s John Mark Camingao (17:54:26) and Rudy Roque (17:55:04) and Team Franzia’s Leonel Dimaano (17:55:10). It also kept Navy at the helm in the overall team race with 70:54:59, almost half an hour ahead of Go for Gold Developmental team with 71:24:25 in the race presented by LBC and supported by MVP Sports Foundation, Filinvest, CCN, Petron, Versa.ph, 3Q Sports Event Management, Inc., Boy Kanin, Franzia, Standard Insurance, Bike Xtreme, SH+, Guerciotti, Prolite, Green Planet, Maynilad, NLEX Sports, Lightwater, LBC Foundation and PhilCycling. Army-Bicycology was at third with 71:41:45. It was the first stage win for Carino, a strong mountain-climber, in this edition and fourth overall in Ronda. He is also the third Navy rider to take a stage win this year after Oranza topped the first two stages and Morales Stage Four. Army’s Cris Joven ruled Stage Three. “They (Oranza and Morales) already have lap victories while I just won one now,” said Morales, a proud son of Mangaldan, Pangasinan. Oranza, for his part, was just glad to play domestique for most part of the 179.4-km stage for Carino and Morales. “If it’s for the good of the team, I don’t mind doing it because I know they will also help me if I need it,” said Oranza, who is seeking his first ever Ronda title after coming close to winning two years ago when he wound up second to Morales. Oranza will continue to don the red LBC leader’s jersey in the 111.8km Stage Six today starting at the San Jose City Hall and ending at the Tarlac Provincial Capitol.